I have been gardening since before I could walk without tripping over my own feet, having been blessed with grandparents on both sides with an affinity for growing their own food. In the soft, loamy soil of suburban North Carolina and the unforgiving red clay of rural Alabama, I learned the basics of growing tomatoes, onions, cucumbers, corn, potatoes, and beans. Having my hands in the dirt resonated with me even at that early age, and even after all these years, that experience remains one of the most treasured gifts I’ve ever received. My adult years found me in locations that are not widely known for being garden-friendly and I had to learn to make do on a Manhattan fire-escape and a single sunny window in my Air Force dorm-room. While those years served to make me appreciate the two acres I call home today, they also forced me to look into ways to extend the typical growing season beyond the standard spring/summer dates. What I learned was that with a bit of know-how and ingenuity it is possible to grow edibles through much of the year and thus began my quest for the four-season garden. The very real impact of climate change is evident to anyone who cares to see it, as evidenced by the updated USDA Plant Hardiness Zone Map that added new zones, shifted others, and increased the temperatures the zones represent. While the causes of these changes are the subject of much speculation and debate, it is crucial that we understand how the changes themselves impact us. When winters are warmer and wetter than normal as they have been for much of the United States in 2012, insect populations are not kept in check by nature. Mosquitoes appear earlier and in larger numbers. Fruit trees require a dormant period in order to produce fruit. That amount of time varies with citrus requiring just a few days while most other fruit trees need at least 45 days of dormancy in which the temperature is in the 45 degree Fahrenheit range. When they don’t get those “chill hours”, crops take a big hit. What if it was possible to have fresh produce from your own garden in the middle of winter when even the gnomes are asleep under a bed of snow? It is, and it isn’t nearly as difficult as you might think. Imagine picking fresh broccoli, kale, cabbage, carrots, lettuce, and spinach for dinner in January, then get ready to make it happen because all of these veggies are hardy to 25 degrees and lower. That means that you don’t have to turn your living room into a rainforest after all! Even better is that many of these veggies taste sweeter after frost. If you give your winter plants a good blanket of mulch, they’ll reward you with home grown goodness all season long. The mulch protects the soil from heavy wind and rain while also insulating the ground against the temperature fluctuations that come along with the typical December, January and February in most of the country. When the weather warms, remove the mulch to allow the soil temperature to warm and retain nitrogen for your new seedlings. Winter is also prime time for planting new trees (like those fruit trees and berry bushes I’ve had my eye on). Cloche is just a fancy word for a protective covering for plants. Cloches are usually made from plastic, though glass works as well. Imagine a mini hoop house and you’ll be on the right track. These are dead easy to put up. A few lengths of PVC and plastic sheeting is all you need to provide protection from inclement weather and light frost. Cold frames are simple to construct, especially if you already have a raised bed or two. An old window or piece of Plexiglas® that will cover the bed is all you need to be able to protect cool weather plants from harsh winter winds and snow. The added protection is enough to keep you harvesting even when the temps have plummeted. Hoop houses and greenhouses can often make it possible to grow plants even in the most unforgiving cool weather zones that don’t usually provide a hospitable environment for tomatoes and peppers. They are also the perfect cure for the winter blues that hit most gardeners by mid-December. Having a sunny room with compost and growing things can improve your mood and your yield. I’m almost ashamed to admit that I never experimented with winter sowing until this year. The process makes sense and it takes a lot less time and indoor space to start your spring seedlings than by using the traditional methods that require germinating, potting up and hardening off before planting vegetable outdoors. 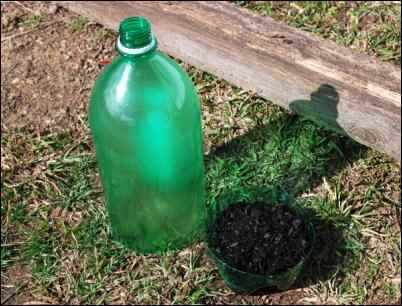 If you have empty two-liter bottles or milk jugs, you have what you need to get started winter sowing your spring garden plants like tomatoes, peppers, even squash or lettuce. 1. Start by cutting around the base of the bottle to create a base cup that is about 2″ high. This is going to be your planter, so don’t make it too shallow. 2. Next, puncture a few drain holes in the base to ensure your seeds don’t drown. 3. Fill the base with your seed starting mix of choice and add seeds to the appropriate depth for what you’re growing. I use a 50/50 mix of composted manure and clean soil and haven’t ever had a problem. 4. Water the soil thoroughly until it begins to drain from the base and cover with the remaining top section of the bottle or milk jug. It is important that you remove the cap from the bottle top to allow for ventilation, otherwise your seedlings will suffocate and likely burn (even in winter). Place your winter sowing containers in a location that can take advantage of available sunlight and be protected from high winds or heavy rains. I found that the space beneath my wooden steps worked perfectly. With winter sowing, you are allowing nature to do what nature does. This can be annoying when you are checking for germination every day, but when the conditions are right, your seeds will grow and they’ll do it in plenty of time for spring planting. Nothing says spring to a gardener like seed starting. Even before the weather warms completely you usually can pick the gardener out of a crowd from the giddy grin on their face. Okay, so maybe that’s just me. As a rule of thumb, 4-6 weeks before the last frost date in your area, you should plan to start the seeds that will feed you and your family for late spring through summer and into fall. Tomatoes and peppers are the ones that usually take the longest to get sizeable enough for the garden, so get those germinating as early as you can, followed by squash, cucumbers and whatever else strikes your fancy. One word of warning: avoid the temptation to be lulled into a false sense of security over warmer-than-usual temperatures and consult your Farmer’s Almanac or local cooperative extension office for the best dates to set out your spring garden plants as well as when it is best to direct sow beans, peas, and corn. If you do tempt fate and plant early, be sure to have protective covering available for surprise cold snaps. I haven’t bought a seedling pot in more than a decade. With so many options for making them myself from recycled, biodegradable materials I didn’t see much of a point in spending the money. Paperboard egg cartons are the perfect size to fill with seed starting medium, and because they’re made from paper they can be potted up as-is; the carton will break down and return to the soil. 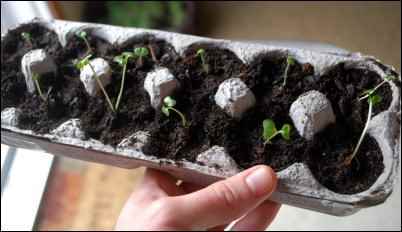 Another option is to repurpose toilet paper rolls for starting your seeds. My primary seedling pots for years now have been those that I make from newspaper. 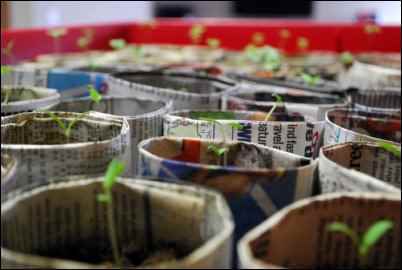 A half-sheet of newsprint will yield a pot that has a similar capacity to a three-inch nursery pot and with careful handling it will last from germination until spring transplanting. If you’d like to learn how, I made a brief video that shows the process of making newspaper seedling pots step-by-step. The summer months are when many of the garden plants are at their peak, and while you should take full advantage to enjoy the bounty, in warmer areas it is also a great time to sneak in a second planting of some of your favorites. 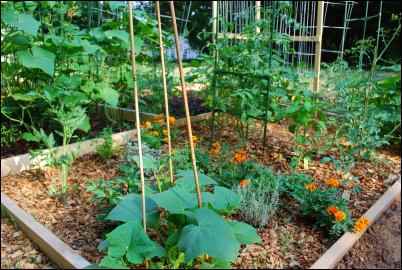 In the southeast we can easily manage two crops of tomatoes and beans, for example. Even if that’s not possible where you live, it is time to start your fall crops from seed to reap the benefits of those fresh autumn flavors. 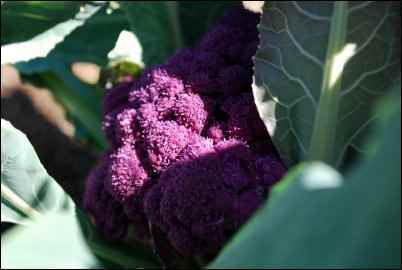 The milder temperatures of Fall bring the return of broccoli, Brussels sprouts, cauliflower and other members of the Brassica family along with lettuce, spinach, carrots, and parsnips. Who could forget the all-important squash and pumpkin? The exact dates for starting fall crops depends largely on your growing zone. 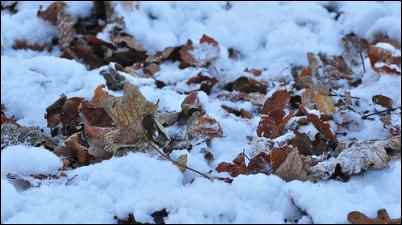 Armed with your first projected frost of the year you can work backward with a calendar to plant the right vegetables at the right time for where you live. Locate the covers for your cold frames, along with your cloches and floating row covers so they will be available should the forecast change earlier than expected. 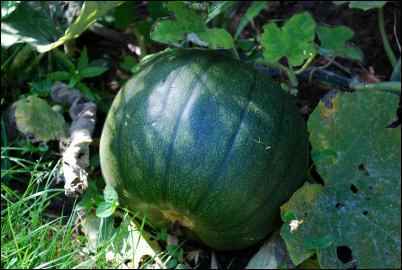 They are also handy for extending the growing season by fooling productive plants into thinking it’s warmer than it is. Fall is also a good opportunity to clean up the garden and give the beds a good weeding. Weeds tend to rebound in the fall, and you’ll want to get ahead of them before they seed and make life difficult in the spring. I’ve found that planting my favorite herbs in a raised bed makes it possible to transform it into a cold frame when the temps dip in late fall, often allowing me to overwinter most of my hardier herbs well into winter. Those that don’t fare well in the cool usually get potted up and brought indoors so that I can continue to enjoy fresh parsley, chives, oregano, et al without interruption. Anyone who knows me has endured at least one of my long-winded talks about the importance of composting for anyone who gardens. Anytime I speak at an event I can count on at least one person telling me that they don’t have time to compost, or that it is too messy. These are usually the same folks who will later ask what fertilizer I recommend, or how much Miracle-Gro to use on their new seedlings. Simply put, composting is the environmentally responsible and overwhelmingly cost-effective soil amendment that will rival the most expensive and highly-touted commercial products on the market. It is the ultimate example of that old saying “Reduce, Reuse, Recycle” in that we reduce the amount of waste going into our bloated landfills while we reuse and recycle kitchen, garden, and lawn waste into true black gold. There have even been studies done that prove you can compost nothing more than spent coffee grounds and shredded paper that yields a nutrient-rich end product that isn’t too far (chemically speaking) from regular compost. If you are planning to leave a garden bed unplanted for a season, the least you can do is plant a cover crop like winter rye or oats. These crops are maintenance free, they control erosion in the off season and they fix nitrogen and other crucial nutrients in the soil, replenishing what is depleted during the growing seasons. Avoid the common mistake of planting the same crop in the same place more than two seasons consecutively. Rotating crops allows the soil to recover. If you do need to plant in the same place again, be sure to amend the soil well with a layer of good compost, composted manure, or your natural fertilizer of choice. Whether you decide to take advantage of your garden by putting it into year-round production or you stick with spring and summer, it pays to know that it is possible to grow more fresh produce than just what can be done between April and September. I have found that several of my favorite fall crops like kale and collards will come back in mid-winter and produce straight through until early summer.